What is the ICD-10 Code for Spastic Quadriplegia Cerebral Palsy? The ICD 10 Code for spastic quadriplegia cerebral palsy is G80.0. G80.0 is a billable/specific ICD-10-CM code that can be used to indicate a diagnosis for reimbursement. The 2018 edition of ICD-10-CM G80.0 became effective on October 1, 2018. The spastic quadriplegia ICD 10 code is a newer code that has replaced the spastic quadriplegia ICD 9 code. ICD-9-CM G80.0 should only be used for claims with a date of service on or before September 30, 2015. For claims with a date of service on or after October 1, 2015, use an equivalent ICD-10-CM code (or codes). Spastic quadriplegia is a form of cerebral palsy where a patient has lost use of his or her entire body. Of the three types of spastic cerebral palsy, it’s the most severe. A patient is unable to use his or her legs, arms and body. The spastic quadriplegia ICD 10 code G80.0 is different from the spastic quadriparesis ICD 10 code. The condition quadriparesis, also referred to as tetraparesis, is characterized by weakness in all four limbs, both arms and legs. The weakness may be temporary or permanent. The spastic quadriparesis ICD 10 code is G82.50 and can be used to indicate a diagnosis for reimbursement purposes. Spastic quadriplegia is typically caused by brain damage before, during or shortly after birth. Many factors can contribute to an infant developing brain damage, including fetal infections, maternal infections, medical negligence or exposure to toxins. 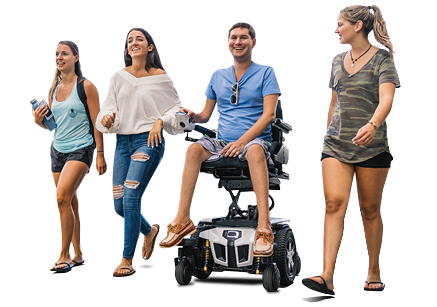 Quantum Rehab, the global leader in providing clinically-based, consumer-focused power wheelchairs, offers technologically-advanced models specifically meeting ICD Codes for spastic quadriplegia cerebral palsy, including ICD-10 G80.0. A patient can submit the ICD 10 code for spastic quadriplegia for reimbursement of a Quantum power wheelchair. The Edge 3 Power Wheelchair accepts a full range of seating, positioning and electronics options to meet the needs of those living with spastic quadriplegia cerebral palsy. Available with optional iLevel® power adjustable seat height, patients can drive at 4.5 mph while elevated up to 12 inches. iLevel’s Extra Stability Technology® enhances daily functionality and quality of life for individuals with spastic quadriplegic cerebral palsy, enabling them to complete Mobility Related Activities of Daily Living (MRADLs), such as grooming, reaching, cooking, toileting and transferring. The Edge 3 electric wheelchair comes standard with front and rear LED fender lights, so users can see and be safely seen while crossing parking lots and streets. A patient with spastic quadriplegic cerebral palsy may benefit from power positioning on his or her power wheelchair. TRU-Balance® 3 Power Positioning Systems on Quantum electric wheelchairs allows for quick and easy fine-tuning of adjustments to ensure the patient’s comfort. Optional configurations include power tilt, power recline, contoured seating, static seating, iLevel and manual recline.